The studio is able to update their Alerts which are displayed and sent to the Parents. !Do not change the Names of the Alerts. You may edit the subject line but not the Name. 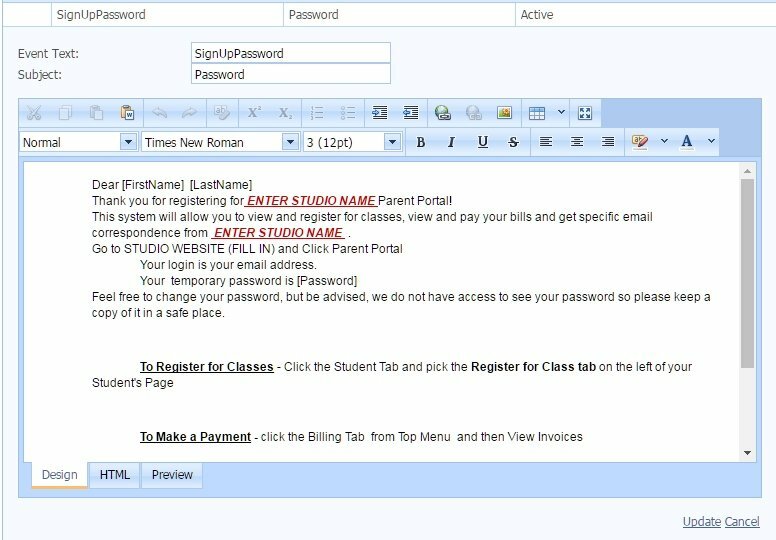 For the School’s Terms and Conditions which must be accepted when enrolling and accessible in the portal through a link on the left side menu. The studio can edit these Terms and Conditions by going to Admin->School Setting Types->Alert Types. Click Edit in front of the SchoolTerms alert. Make your changes to the alert. You may edit this alert if you wish to great your customer in a different way than currently stated or give the customer specific instruction as to how you wish them to use the system and what to expect from the studio. For example, you may state that a registration fee invoice is ready for payment to in order to accept an classes enrolled or that the studio will contact the customer within the next 72 hours to review the student’s ability or class selection. All fields with a [hard bracket] will be auto-populated by the system when sending. Make sure you click Update to save the alert. 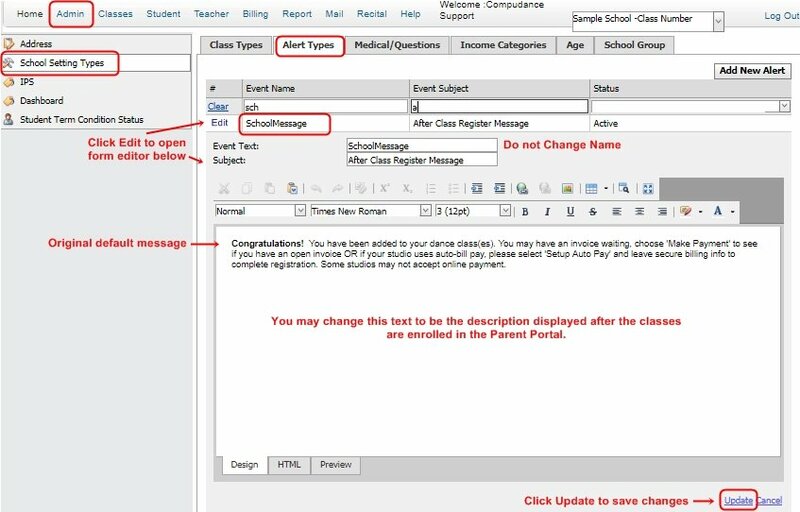 In the Parent Portal there is a pop-up message displayed after a student is Enrolled in Classes. You may edit this message by changing the alert “SchoolMessage”.